The Standing Stone: Guest Post: "Shrule Castle" by Máirtín D'Alton. Guest Post: "Shrule Castle" by Máirtín D'Alton. 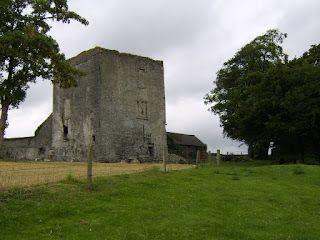 Shrule Castle is situated a few kilometres upstream from Carlow town, adjacent to the Barrow River in Co. Laois, against some domestic farm buildings. The castle is not depicted on the 1563 maps of the midlands, which documents the confiscation of the Gaelic Lordship of Leix and its transformation into the shire of Queen’s County during the Plantation of Leix and Offaly. A church is shown but not named; this is probably the now disappeared Shrule Church. 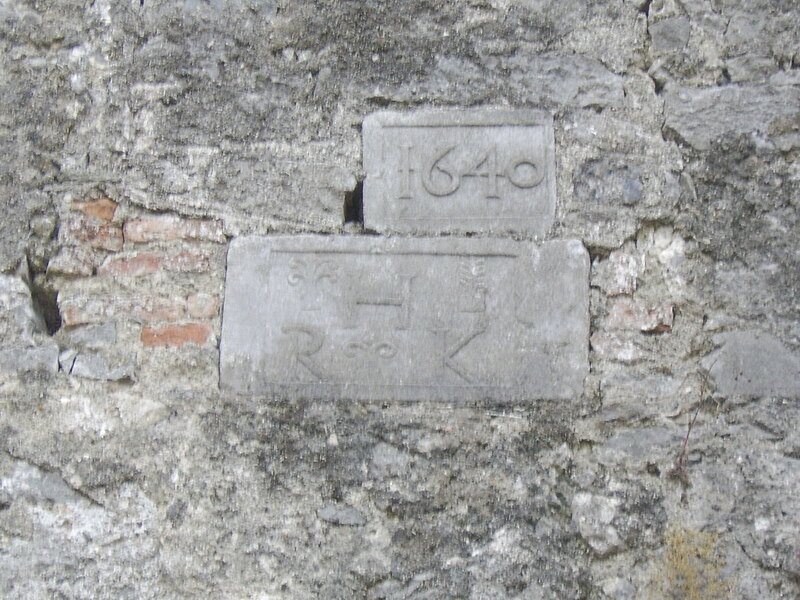 Hartpole seems to have managed to achieve a stake in the Plantation about 1563 at Coolbanagher, elsewhere in Leix. Hartpole had been a soldier in Ireland since the mid 1550s when he was a deputy constable of Leighlin Bridge Castle. Lord Walter FitzGerald states that Shrule was granted to Robert Hartpole in 1575. Shrule Castle looks slightly unusual in comparison to most tower houses. Constructed of coursed limestone, it has an almost square floor plan of c. 11 x 12 m. This makes it somewhat larger than typical tower houses, and although similar in height, with four storeys and parapet above, it appears somewhat more squat than most tower houses. Hartpole’s wife at this point evidently preferred to be referred to by her maiden name; Gráinne O’Byrne. Perhaps on account of his later activities they had grown apart. Donogh O’Lalor, previously referred to, was possibly the master mason of Shrule. Shrule displays some very fine detailing; such as the corner window illuminating the spiral stairs, and give the impression of being well constructed; although it was inhabited till about the end of the eighteenth century meaning a good state of preservation. Hartpole’s involvement with native masons, not to mention native wives, may give an indication of the practical nature of the plantation of Leix and Offaly, wherein only the top strata of society was effectively removed and transplanted. Hartpole’s castles thus constitute part of a unique group of plantation era structures, a series of buildings that were previously believed to have no standing remains, if they ever existed. .
presumed to represent Robert Hartpole and his wife Katherine Bowen. 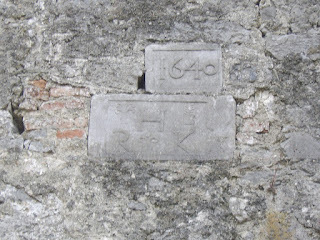 Datestones are often confusing; as frequently they record themselves and nothing more. 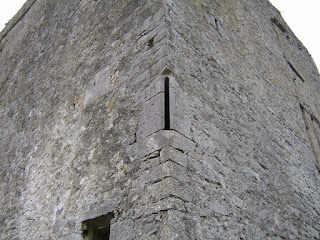 Hartpole was constable of Carlow Castle until his death in 1594, where he was succeeded by his son William. His tomb, believed to have been in St. Mary’s Church in Carlow, was adorned with a fine effigy of Hartpole in armour. If Hartpole wished to commemorate himself as a valiant knight in shining armor, a particularly noteworthy detail of his service in Ireland contradicts this view. ‘Fifty one in county Offaly and thirty seven in Leix. Half the Grantees were soldiers (five of whom came from Scotland and four from Wales). Most were Roman Catholic. About a third were new English, another third were Irish, while only 17 % of the settlers came from the English Pale’. One of those Irish excluded from the Plantation settlement was the eldest son of the last legitimately recognised Lord of Leix; Rory Óg O More. Despite an encouraging approach to Lord Deputy Sidney in 1571 for restitution to his father’s estates, nothing appears to have happened, so Rory took up arms and attacked the plantation directly; apparently as a form of aggressive negotiation. Grantees of the plantation were obliged to military service for three days with servants armed. The Gaelic Irish grantees were summoned under these terms to the earthen rath of Mullaghmast in Co. Kildare on New Years day 1577. There they were massacred by the English planters, including Francis Cosby and Robert Hartpole, acting under the authority of Lord Deputy Sidney. ‘gnímha nachar dhaighmaiseach beacan reimhe, i Mullach Máisteann, (ar son) an ghúisdís Sir Henry Sitny, Hartpól saxanach do mhuintir an ghiuisdís sin’. Translation: Recent disgraceful actions carried out at Mullamast on behalf of the Justice Sidney by Englishman Hartpole of the household of the same Justice. ‘A horrible and abominable act of treachery committed by the English of Leinster and Meath upon that part of the people of Offaly and Leix that remained in confederacy with them, and under their protection. It was effected thus: they were all summoned to shew themselves, with the greatest number they could be able to bring with them, at the great rath of Mullach-Maistean; and on their arrival at that place they were surrounded on every side by four lines of soldiers and cavalry, who proceeded to shoot and slaughter them without mercy, so that not a single individual escaped, by flight or force’. (M1577.14). The numbers killed are in dispute, between 40 (from the English Report) to 400 (from Irish Report). Sir Jonah Barrington recorded the fate of the last of the Hartpoles of Shrule, George, and his ruin due to his bad marriage and melancholy nature at the end of the eighteenth century. Barrington states that the castle, though inhabited, was already dilapidated by this point. A rather silly and mean spirited legend emerged about the Hartpoles thereafter; wherein the family’s doom and extinction was assured on account of the alleged murder of an Irish catholic priest by the original Robert Hartpole in the yard of Shrule. This may be considered unlikely, for as mentioned earlier, and confirmed by Ivan Cosby, the Hartpoles remained catholic until 1640. The source of this, and many other scurrilous tall tales was one Daniel O’Byrne, a ‘decayed’ gentleman of Kellyville, and possible relative of the first Hartpole’s wife, who blamed his straightened circumstances on the confiscation of native land some three centuries previously. Attempting to alleviate his distress; he wrote a history of the Queen’s County in 1856 where he recorded his low opinion of the planter gentry of Leix, or ‘tribes’ as they liked to be called. Only the Bland family of Blandsfort, who assisted in the cost of publication, escaped his spleen. The legend, and possibly the memory of Mullaghmast which had recently been stoked by Daniel O’Connell’s mass meeting on the hill, made such an impact that when Hartpole’s forgotten tomb was uncovered during a renovation of the graveyard of St. Mary’s Church at the end of the nineteenth century, it was decapitated by the angry workmen, and had to be taken into the grounds of Kilnacourt House in Portarlington by a distant relative for safety. 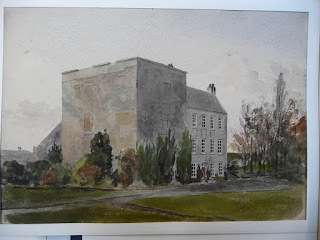 After the death of George Hartpole in Bristol, in the company of Barrington, the castle had descended to the Lecky family and seems to have been abandoned in favour of a handsome, if unassuming 4 bay Georgian house of early eighteenth century appearance; built adjacent to the north. The castle is shown in ruins in the First Edition O.S. 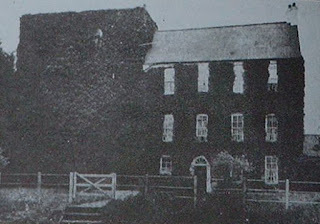 ; the house adjacent being the residence of Hasting Herring Cooper in 1837. 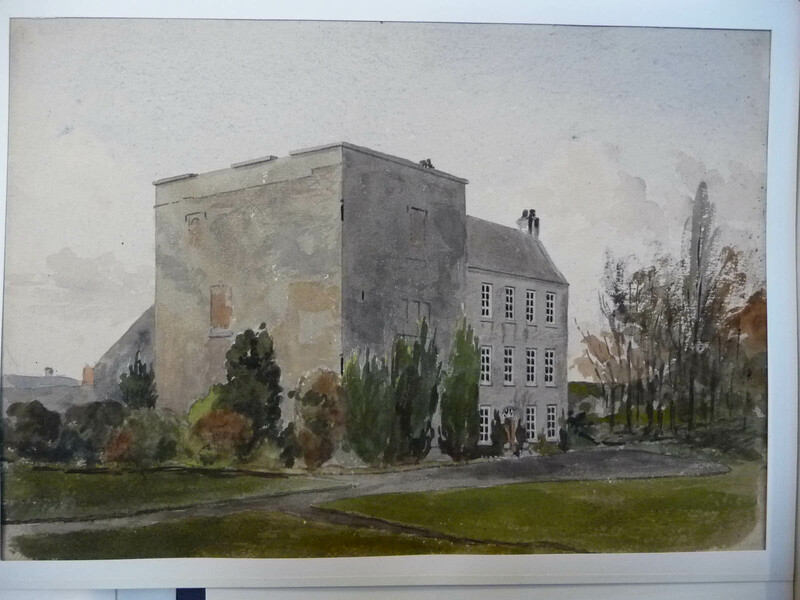 A fine water colour of the castle is dated 15 November 1864. Although abandoned, the house communicated with some of the intramural chambers of the old castle through the half landing on the main stairs, and a chimney was inserted blocking one of the double light windows of the top floor of the tower. The house was destroyed by fire circa 1940 and the ruins cleared thereafter. A new farmhouse was built a short distance to the south, screened from the castle by evergreen trees. The death and removal of these trees a few years ago brought a crack in the south wall of Shrule Castle into acute focus of the owners, who with commendable energy repaired, and consolidated the walls. This is to be contrasted with the behaviour of the owners of Coolbanagher Castle, another Plantation era Hartpole castle, who used a JCB digger to remediate the problem of a fall of masonry from the castle due to a storm in February 2014. Predictably this led to the collapse of the entire castle. There has been no apparent sanction for this activity. By comparison, the full force of bureaucracy was apparently brought to bear on the owners of Shrule Castle to prevent them from continuing with their repair works. This can, it seems, only continue under the imprimatur of Laois County Council and the Heritage Council; the same bodies who appear to have abrogated their responsibility to Coolbanagher. Although not permitted, it is considered a ‘good defence’ under the 2000 Planning Acts that unauthorised works to a protected structure were undertaken for that structure’s preservation. National monuments it seems will not be afforded the same courtesy. And at a time when all state bodies are bemoaning their lack of funds to undertake any repair; one would imagine that a private citizen, willing to spend their own money on the protection of a priceless piece of Ireland’s heritage, would be encouraged and assisted. Hartpole’s effigy meanwhile, mouldered by the banks of the Barrow in the woods of Kilnacourt further upstream in Portarlington, where it was known as ‘Seán a’ Feeka’; the name of a neighbouring Planter, John Bowen of Ballyadams, who had also received the Daniel O’Byrne treatment. Fired by the lurid, bloody, (and generally imaginary) tales of local historians, the effigy again began to receive unwanted attention from local vandals keen to avenge perceived historical wrongs, and again had to be taken into protective custody. This time it was rescued by Laois County Council and placed in a storage depot. Today it lies unloved in the centre of Portarlington’s People’s Park. Perhaps consideration should be made for returning the effigy to Carlow, where it can be nearer to the remains of Robert Hartpole, whereby all ghosts can be put to bed. From Portarlington Máirtín D'Alton graduated DIT Bolton Street 1998, member RIAI 2003, MLitt 2009 TCD under supervision of Roger Stalley on architecture of Leix/Offaly plantations. Awarded Desmond Guinness scholarship from Irish Georgian society 2009. Architectural consultant and studio tutor Dublin School of Architecture. We are very grateful for his contribution. This post also provoked a response from the Heritage Officer for County Laois, Catherine Casey. This can be read here.